Should The Bible Be Read In Order? 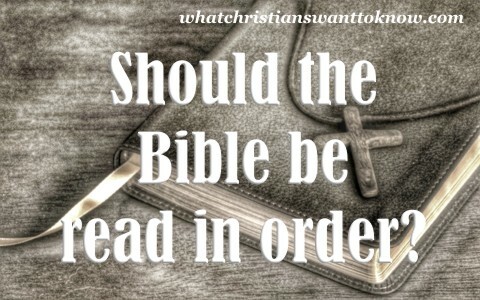 Should we read the Bible in the order in which it comes or in a different order? We might be surprised to know that most of the Bible is not written in Chronological order, which means the order in which the books of the Bible were written. For example, most scholars believe that the Book of Job is the oldest of all of the books in the Bible and Job’s account would be about 1/4th of the way through the Book of Genesis, so the Book of Job predates the other books of the Bible. I have a chronological Bible that has the books of the Bible placed in the order in which it is believed that they were written. Another example is in the Book of Psalms. Many of the Psalms were written when David was king of Israel but the psalms appear much later in the Old Testament than does David’s account in 1st Kings and in 1st Chronicles. Even the Book of Revelation is not written strictly in a chronological order so should we read the Bible from Genesis to Revelation and stick to that order or should we go back and forth between the Old Testament and the New Testament? What are the advantages of reading the Bible in the order in which it comes? I believe that the Book of Genesis should be one of the first books in the Bible we should read. Not because it comes first but it gives us an explanation about the fall of man and why God moved men and history to a point where He could redeem them, even in the Old Testament. Was the doctrine of being saved by faith alone in the Old Testament? Yes, it was in the very first book in the Bible, the Book of Genesis. When God told Abram (later changed to Abraham), “Look toward heaven, and number the stars, if you are able to number them.” Then he said to him, “So shall your offspring be” (Gen 15:5), and Abram never argued with God or told Him that he was too old to have a baby at his age. Instead, “he believed the Lord, and he counted it to him as righteousness” (Gen 15:6). Abraham’s great faith in God was still a supreme example of having faith in God to the saints in the New Testament as the author of Hebrews wrote that it was “By faith Abraham obeyed when he was called to go out to a place that he was to receive as an inheritance. And he went out, not knowing where he was going” (Heb 11:8). Faith in God is not unique to the New Testament because Abraham believed God, so did Moses, David, Joshua, and dozens of other Old Testament saints of God. We can read the Bible in any order in which we choose or we prefer too but I still believe we must begin with the beginning in the Book of Genesis because it reveals the reason why mankind needs a Redeemer. Without the background of the Book of Genesis, we might not understand why Jesus had to come and live a sinless, perfect life for those who could not (which is all of us) and why mankind was banned from the Garden of Eden, symbolic of man’s losing fellowship with God and being separate from God by their sins (Isaiah 59:2). It would be unwise for a new believer to begin with the Book of Revelation and not know the reason why God’s wrath is so fierce on being poured out on the lost. Again, the Book of Revelation itself is not written in a strict chronological or time-sequence order so it might be confusing to a new believer in trying to understand why all of these events are occurring. It might seem overly harsh to those who don’t understand God’s view on sin and why His wrath is justified. Without having the proper understanding, the wrath of God seems out of place but this same wrath of God makes God’s mercy so relevant to sinners. This is only my personal opinion but I believe we should have a Bible reading plan and that plan should be a daily reading plan. I believe it shouldn’t be a random, pick and choose, but a predetermined reading plan that has a prescribed order. For me, I begin with the Book of Genesis but I also alternate my Bible reading with both the Old Testament and the New Testament so I read some out of the Old Testament and then some out of the New Testament. We have already read that we should begin with the Book of Genesis but in doing that, there’s nothing wrong with supplementing your daily reading with another book in the New Testament. Right now, I’m in the Book of Joshua but also in the Gospel of John so I read some out of Joshua and then some out of John. I find it interesting that often times what I read out of the Old Testament is referred to in the New Testament because these testaments are not mutually exclusive but inclusive. One order suggested was this; Genesis, John, Joshua, Mark, Judges, and Acts. I keep going back and forth between the two testaments in order to take in both on a consistent and daily manner. Jesus told His disciples that He is “the true vine, and my Father is the vinedresser” (John 15:1) and that “Every branch in me that does not bear fruit he takes away, and every branch that does bear fruit he prunes, that it may bear more fruit” (John 15:2) so how do we abide in the vine and what is the vine? Jesus is the vine; the true vine, and we must abide in Him and that means abiding in His Word (John 15:5) because we’re not able to bear fruit on our own (John 15:4). Since we know that the Word of God is the Bible and Jesus is the Word of God (John 1:1, 14), we must abide daily in the Word so that the Word will abide in us. To abide in means “to dwell in” or “be in” so we must be in the Word of God so that the Word of God is in us. We can’t do anything without Christ (John 15:4) but with Christ and His Word we can do all things within the will of God (Phil 4:13). You have freedom to read where you want to read in the Bible but the Bible is written in an order that was determined by scholars. Chapters and verses and even periods and exclamation points were added by the translators in order to help us find certain passages and chapters. The Bible was not written in the order in which it appears and neither was the time-sequence the same (chronological order) so you have freedom to read where you want to read. It is strictly a personal choice but you would do well to have a specific Bible reading plan and one that includes daily reading of both the Old Testament and the New Testament so that you might make better sense of what you’re reading.